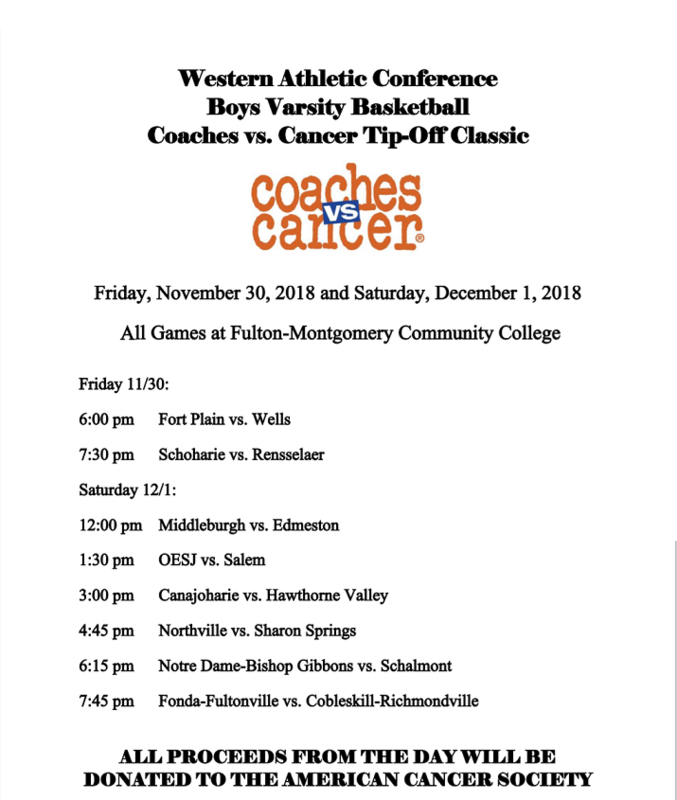 The 2018 Boys Varsity Basketball Coaches vs. Cancer Tip-Off Classic is being held on November 30th and December 1st at Fulton-Montgomery Community College. This two day event will feature 8 Boys Varsity High School Basketball games including the following schools, Rensselaer, Schalmont, Hawthorne Valley, Canajoharie, Northville, Sharon Springs, Oppenheim-Ephratah – St. Johnsville, Schoharie, Cobleskill-Richmondville, Edmeston, Middleburgh, Notre Dame-Bishop Gibbons, Wells, Salem, Fonda-Fultonville, and Fort Plain. All proceeds from this event will be donated to Coaches vs. Cancer and the American Cancer Society. There will be an admission fee and a raffle featuring various items that have been donated by the community. Last year the tournament raised $4,526.75 and the year before $4,103.00 for the American Cancer Society. Here are few highlight clips from last year’s tournament.